We’ve revolutionized grilling rib eyes, again. With the power of the Summit Charcoal Grill and the convenience of the Gourmet BBQ System Sear Grate, you can give your rib eyes a delicious new edge. 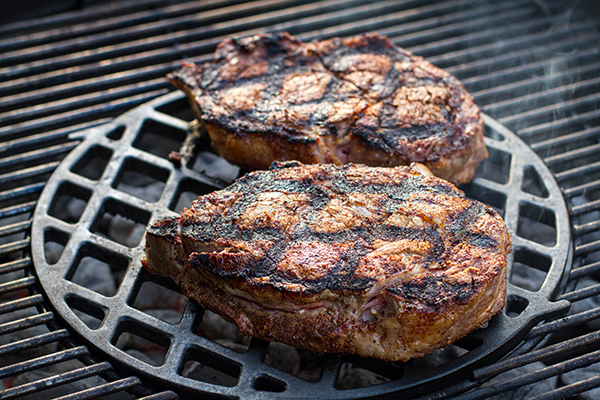 Although there are myths about searing, sear marks give your favorite foods that undeniable flavor and come easy when using the Gourmet BBQ System Sear Grate. Made out of cast iron, the sear grate insert retains heat and helps to make those unmistakable diamond cross-hatch sear marks. On top of that, this recipe uses a cilantro-lime compound butter – the happy result of mixing some of your favorite ingredients into softened butter. Compound butters are a great way to add a note of bright flavor to grilled meats, especially steaks. The Gourmet BBQ system is one of many versatile features of the new Summit Charcoal Grill, our latest innovation in charcoal grilling. For more information on the Summit Charcoal Grill, click here! Join the conversation at #grillofalifetime and grill on! Note: Compound butters, the happy result of mixing some of your favorite ingredients into softened butter, are a great way to add a note of bright flavor to grilled meats, especially steaks. You can make compound butters, wrap them in plastic wrap, and keep them in the freezer for up to 6 months. 1. Melt 1 tablespoon of the butter in a small skillet over medium heat. Add the shallot and cook until slightly softened, about 2 to 3 minutes, stirring occasionally. Transfer to a small bowl and cool 5 minutes. Add the remaining 4 tablespoons softened butter, cilantro, lime zest, salt, and chipotle pepper to the bowl with the shallots. Blend thoroughly with the back of a spoon, until uniform. Transfer mixture to a sheet of plastic wrap, shaping the butter into a small cylinder in the center. Twist the ends to make a more compact cylinder about 3½ inches long. Transfer to the refrigerator until ready to use; 45 minutes or longer. 2. Remove the circular Gourmet BBQ System™ grate insert, and prepare the grill for direct grilling over high heat (450°F to 500°F). Insert the sear grate and preheat with the lid closed for 15 minutes. 3. Combine the sugar, ancho chili, chili powder, onion powder, coriander, salt, and pepper in a bowl. Pat the steaks dry. Lightly coat both sides of each steak with oil and evenly season the spice mixture. Let steaks stand at room temperature for 15 to 30 minutes. 4. Place steaks on the sear grate and grill over direct medium-high heat, with the lid closed, 6 to 8 minutes, turning once. Slide the steaks to the surrounding cooking grate over indirect heat and grill 2 to 3 minutes longer for medium-rare or until desired doneness. Remove steaks from the grill and let rest 2 to 3 minutes before serving. 5. Remove the cilantro-lime butter from the refrigerator. Cut into 8 slices. Top each steak with 1 to 2 slices of the butter, reserving any extra butter for another use. © 2016 Weber-Stephen Products LLC. Recipe from The Weber® Summit™ Charcoal Grill Cookbook. Used with permission.